If you ever need to contact us about placing a booking or making an order, please use the number provided below. 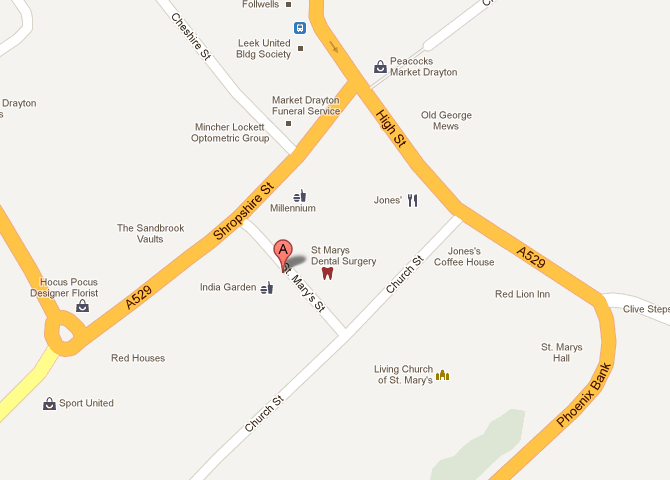 We are located in on St Mary's Street in Market Drayton. We feel our food speaks a thousand words, and our customers tell us. We feel there are many components needed to run a successful restaurant. These include the highest standard of food, outstanding customer service and a pleasant atmosphere. If you are not completely satisfied with anything please let the management know and we will do everything in our power to correct any issues you might have. We only use the best ingredients to create a truly authentic taste. We take out inspiration from the different cultures presented to us. Bengali, Indian, Pakistani cuisine is in our blood and we feel that we have the responsibility to share our passion with our customers. Needless to say that all our dishes are freshly prepared there and then and are made to suite all pallets. From our fiery Vindaloo's to the mild Korma's. We have plenty of experience in the restaurant business, as the oldest genuine Indian Restaurant in Market Drayton (since 1992). Anyone can make a claim that they are the 'best restaurant' or they have the 'best food', but this can only be decided by one person, the customer. That's why we welcome all comments and feedback so that we can judge what we are doing well and what we might need to improve upon.